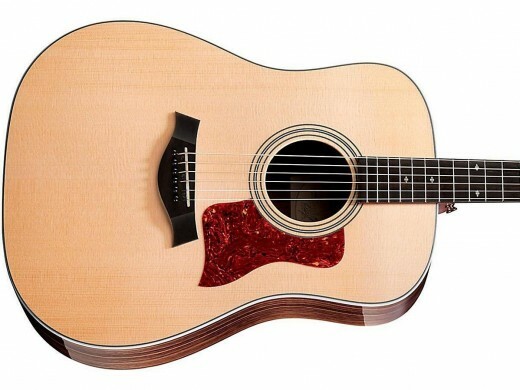 The Taylor 210 Deluxe is one of the best acoustic guitars you'll find for under $1000. If you are a guitar player planning to spend around $1000 on a new acoustic guitar you want to get the best instrument you can for your money. You have a lot of choices, from iconic brands like Martin and Taylor, to overseas companies such as Yamaha, and even small luthiers who may build exactly what you’re looking for. A thousand dollars is a big chunk of change, so choose wisely! I think there are three main things we need to consider when deciding on a guitar in this price range. Quality: Of course this is first and foremost. When you are dropping this much cash you need to know you are getting a solid instrument. You'd think a grand would get it done, but some of the guitar companies in this review offer instruments costing three, four and even five times as much. When they put out what they consider "budget" instruments you want to know you're getting their best effort. Value: You can certainly spend more if you really want to, but you shouldn't have to sacrifice your life savings to find everything you’re looking for in a new instrument. Some of the same companies that make expensive instruments also make more affordable guitars for the veteran picker or semi-pro musician. That's what you are looking for in this price range. Sound and Style: You know you need a guitar that sounds greats, is fun to play, and will get the job done for years to come. You want an instrument you’ll love, and one that meets your expectations for sound quality and craftsmanship. At this price you have a right to be a choosy. 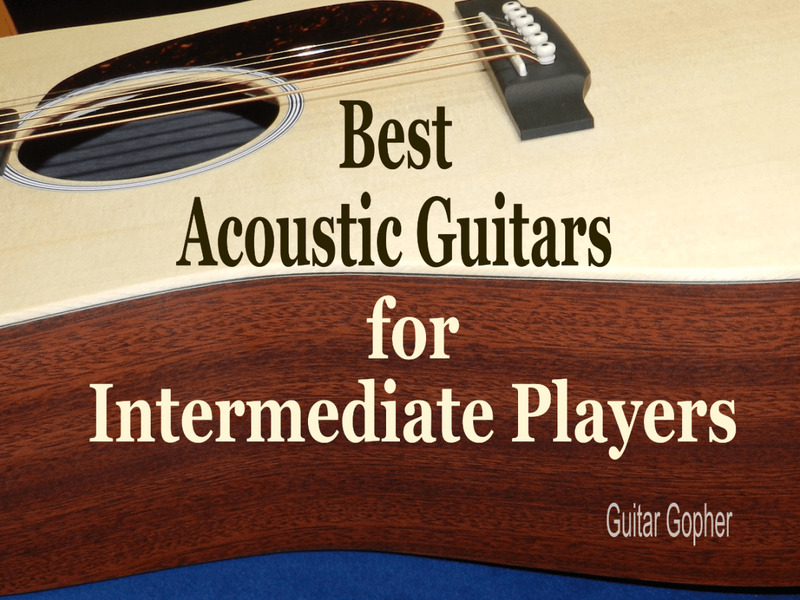 In this article you’ll read about several great acoustic guitars that I think make the cut. You really can't go wrong whichever you choose, but each guitar is unique in it's own way. And, it doesn't hurt that they're made by some of the world's finest acoustic guitar companies. These are brand names you can take to the bank, and when you're parting with this much coin that's important. So, let's get to it! 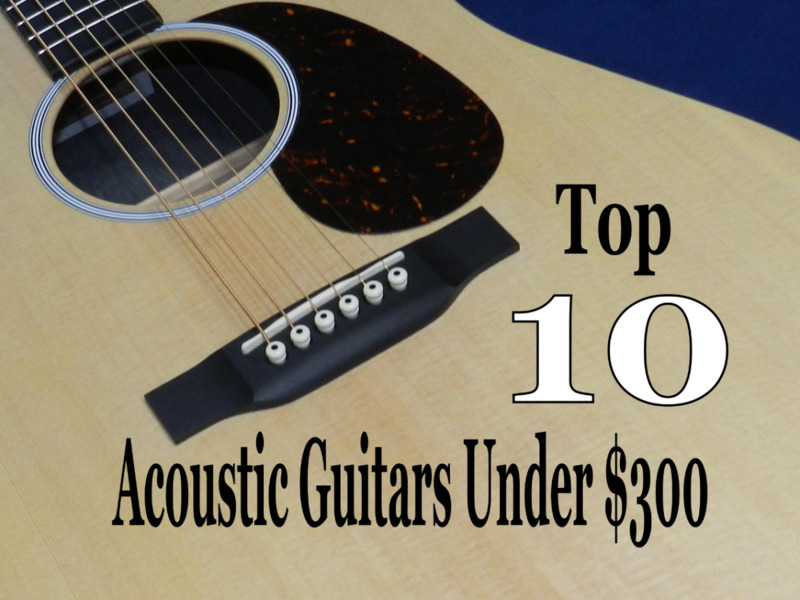 Here are my picks for the top acoustic guitars under $1000. Seagull Guitars is a Canadian company known for making outstanding mid-level guitars such as the S6 Original. The Artist Series is the top of their line, and the Mosaic is the perfect example of an all-solid-wood guitar that’s made in North America for a great price. The Mosaic gets the top spot on my list. It starts with a solid-cedar top, which provides a bit more more midrange than spruce. The back, sides and neck are all mahogany, a warm and resonant tonewood. This combination creates a deep, rich sound that will make the Mosaic stand out when compared to traditional spruce-top guitars. The ebony fretboard adds some crispness to the tone, and helps to bring out a little high-end clarity in individual notes. Seagull guitars feature a tapered headstock, designed to bring the middle strings closer together and improve tuning stability. But this certainly isn’t the only unique thing about the appearance of this guitar. With a pretty gull logo at the 12th fret, and off-centered fret markers the Mosaic really looks incredible too! Seagull guitars are a bit off the beaten path, but definitely worth checking out. With some of the big, famous brands, when you spend $1000 you’re getting a guitar with cost-cutting measures, and paying something for the name on the headstock. With Seagull, a guitar like the Artist Mosaic represents their best effort, and it really shows. Check out the Seagull Artist Series! Taylor is another guitar company known for their incredible instruments and they are among the top guitar companies in the world. Taylor is an American company based out of El Cajon, California; however, some models, such as the 200 series, are assembled at their Mexico plant. This shouldn’t be a turnoff, though. It’s still a Taylor! The 210 has a Sitka spruce top and rosewood-laminate back and sides. Rosewood is always a good choice, not quite as warm as mahogany but still nice. The laminate, as opposed to solid wood, keeps costs down. The neck is sapele, to add a little more resonance. The fingerboard is ebony which, along with the spruce top, will add some bite to all of these rich-sounding tonewoods. Even though this is a less-expensive Taylor it still features beautiful appointments, such as the tortoiseshell pickguard, Indian Rosewood truss rod cover and headstock overlay, and gloss top. Top-end Taylor guitars can cost many thousands of dollars, but it’s nice to see an affordable instrument from this company. You really can’t go wrong with a Taylor guitar. Even though they’ve kept the price down the 210 is still a guitar that lives up to the name on the headstock, and one of the best acoustic guitars under a grand out there today. The Taylor 210 is also available in an acoustic-electric version, as the 210 CE. It has the same great build quality, with the addition of a pickup and preamp. PRS guitars are known as high-quality instruments. Most notably, their electric guitars command big bucks from discriminating players who want top-notch sound and performance. But some years back PRS took a step to satisfy those among us with lighter wallets by introducing their SE Series. SE Series instruments bring all the good stuff PRS is known for in a more affordable package. 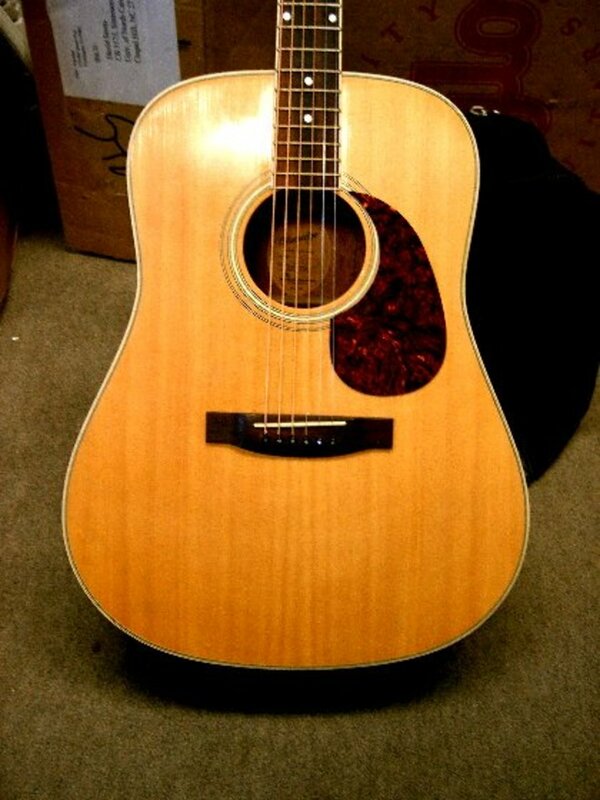 In this case we are looking at a fantastic acoustic guitar, the SE Angelus Standard. This is a guitar with a solid Sitka Spruce top, mahogany back and sides and a rosewood fingerboard. It’s a classic tonewood profile, with the warmth of the mahogany, sweetness of the rosewood and punch of the spruce combining for the kind of ideal acoustic tone you’d expect from a PRS. However, this is a guitar with a few tricks up its sleeve. The single-cut design isn’t just attractive; it makes the guitar more comfortable to play in the higher registers. A bone nut and saddle let notes ring crystal clear. Those PRS birds as fretboard inlays are pretty cool too. If you’re looking for something just a little different than the typical dreadnought-style acoustic guitar this is one worth considering. I’ve always loved PRS gear, and the SE Angelus Standard won’t disappoint. Martin acoustics are some of the best in the business, and the C.F. Martin Company has been around for over 150 years. These are high-quality, American-made instruments, manufactured in Nazareth, Pennsylvania. Most Martin guitars will put you well over your $1000 spending limit. But Martin does have some compassion for those of us on a budget, and puts out a few great guitars you ought to be able to grab for under a grand, if you're patient. The Martin DRS2 is one of those guitars. The DRS2 features a dreadnought-style body with a solid Sitka spruce top and solid sapele back and sides and a select hardwood neck. The sapele combines with the spruce top to provide a nice combination of depth, volume and clarity. The fingerboard and bridge are black richlite, an interesting choice in a guitar at this price point. 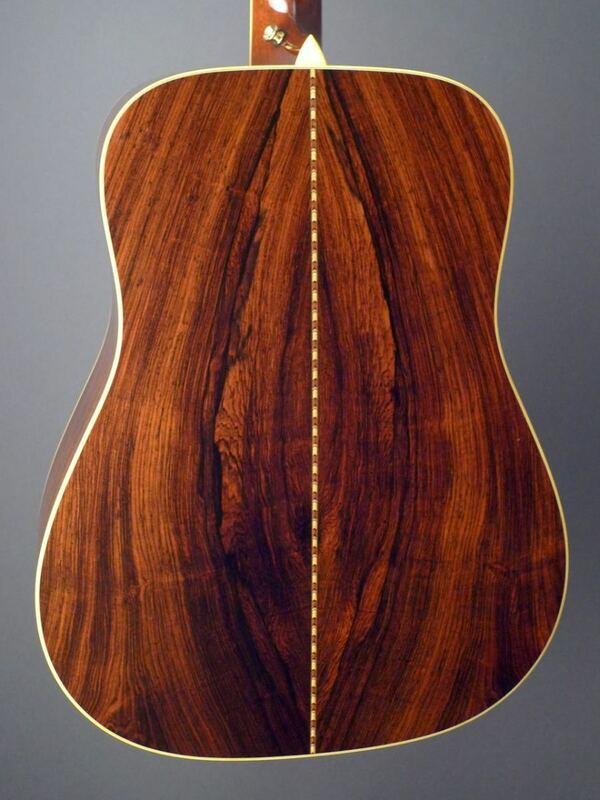 In fact, this is about the best Martin I've seen for under a grand. While a guitar company known for high-end acoustics would typically cut a lot of corners on lower-priced instruments, here we see some excellent appointments. Well done, Martin! Alternative tonewoods and materials like Richlite and sapele might give pause, but really they shouldn't. The over-harvesting of traditional tonewoods is a serious issue. Brands like Martin and Taylor have become leaders in the responsible management of wood resources. So, particularly when you look at guitars at this price range and lower, don't be surprised to see some alternative tonewoods used. That's okay, and it's something we all need to get used to. Blueridge is a guitar brand owned by Saga Musical Instruments. They’re made overseas, but Blueridge guitars have been gaining a reputation in recent years for great sound, and great value. Blueridge specializes in pre-war reproduction guitars, and the BR-240 is part of their pre-war series. What the heck does that mean? Prior to WWII acoustic guitars were made to somewhat different specifications. Some materials they used are no longer cost-effective due to overharvesting, but most notably the solid woods and sturdy inner bracing techniques make pre-war guitars desirable for their tone. Some also believe the construction methods themselves were superior, as they relied less on machines and more on people. The BR-240 utilizes a solid Adirondack spruce top along with solid mahogany back, sides and neck. This is a combination that lends to both depth and projection, and mahogany is a beautiful wood. The ebony fretboard allows notes to ring crisp and clear, and the gloss top and tortoiseshell pickguard make for an attractive instrument. If you don’t mind buying an instrument made overseas, the BR-240 is a great guitar for a great price. The saved cost of production allows them to use higher-quality materials, and you end up with a guitar that probably should cost a few hundred dollars more than it does. Players who are into bluegrass may particularly appreciate this guitar for its projection and solid construction. Just about every guitar in this review has a dreadnought body shape, so here’s a cool option for those more interested in large, jumbo-bodied acoustics. Guild is a guitar company with a strong reputation, known for quality acoustic instruments. Like Taylor and Martin they make some outstanding instruments at high price points. But, through their Westerly Collection, they present some great acoustics that are affordable for working players. The Westerly F-150 is a jumbo acoustic with a solid Sitka spruce top and solid Indian rosewood back and sides. It’s a great tonewood combination with plenty of warmth and articulation, and the jumbo body really allows the notes to ring strong and clear. And that’s one main reason some guitarists prefer a jumbo body. While dreadnoughts certainly have strong projection and an excellent sound throughout the tonal spectrum, jumbo guitars take it a step further. This has made them a favorite of performing musicians, from country pickers to rock stars to singer-songwriters. The F-150 also features an Indian rosewood bridge and fingerboard to round out an outstanding tonewood profile. Should you consider a jumbo-bodied guitar? That’s up to you, but if you decide to take the plunge take a good look at the F-150. It’s impossible not to bring up Yamaha when it comes to acoustic guitars. Yamaha is a Japanese musical instruments company that most players are no doubt familiar with. They make all kinds of instruments, from basses to pianos to woodwinds. Along with their other accomplishments, these guys are known for top-quality acoustics and the LL16 is a jumbo-bodied guitar that lives up to the reputation. The LL16 features a solid Engelmann spruce top that will make the treble tones sing. Solid rosewood sides and back, and a mahogany/ padauk 3-ply neck add some resonance and depth to the sound. Along with the ebony bridge, this setup will bring out the crisp, deep traditional acoustic tones many players covet. The gold hardware and gloss finish make it look as good as it sounds. Yamaha acoustic guitars are good-quality instruments that sound amazing and offer tremendous value. It’s tough to get an all-wood guitar from a big-name manufacturer in this price range, but Yamaha delivers. This attention to quality and performance is what makes the Yamaha LL16 one of the best acoustics under $1000 you’re going to find. If you do your homework you ought to be able to find one for a great price online or at a local shop. Never heard of Recording King? This is a brand that started out in the 1930s, making guitars for department store catalogs. They re-emerged in 2007 under the umbrella of the Music Link, and they’re quickly building a reputation for some really incredible acoustic guitars. They’re a bit of a secret for now, but that’s not going to last long. The RD-316 is an all-solid-wood guitar with AAA Adirondack Spruce Top, and Solid African Mahogany back and sides. The one-piece mahogany neck and ebony fretboard rounds out a combination of tonewoods that presents great depth and warmth with just the right amount of top-end bite. Like the Blueridge above, the Recording King incorporates some classic specs in its design, such as the strong inner bracing and dovetail neck joint. 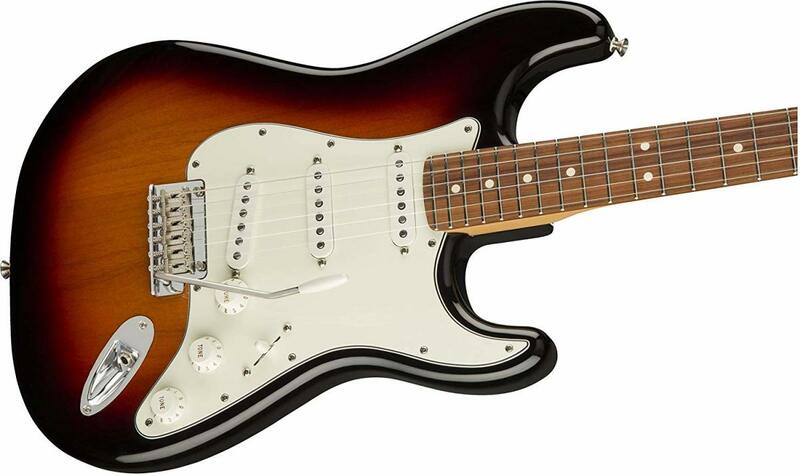 This is a no-nonsense player's guitar, built to get the most out of its tonewoods and construction. Still, no doubt, this thing looks like a guitar that should cost more than it does. If you’re looking for that dark horse in the lineup that offers great value and sound you may want to check out Recording King. This brand is certain to grow in popularity over the next decade, and you’ll forever be able to brag to your friends that you got one first. Someday you may decide to move up to a Taylor or Gibson that costs several thousand dollars, but chances are you’ll be afraid to take it out of the house! You may end up feeling like your guitar is better off in a museum than on your lap. And don’t even think about the look your spouse will give you when you tell them you’re dropping $4000 on a new guitar! Around $1000 is the just about the right price for getting a quality guitar you won’t feel guilty about owning. These guitars are players, and they look good and sound amazing. Of course you can pay a lot less too and still feel pretty good about yourself. After you’ve been playing for a while you start to realize that gear only goes so far, and the real sound is in the player. Expensive guitars are nice, but really it’s the musician that makes the music. You can really drive yourself crazy worrying about gear, tonewoods and guitar brands. The time you spend worrying about that stuff is time better spent practicing. Choose your new instrument wisely, find the best guitar for under $1000 you can, and play on. You’ll get great value and a guitar that will last for the rest of your life. Which acoustic guitar builder do you think offers the best value for around $1000? Are Washburn acoustic guitars any good? I think so. I especially like their Woodline Series for intermediate players, and they have some all-solid-wood guitars in their Heritage Series for well under $1000. I would check out Washburn if you are looking for a new guitar. This is a brand that has been around for a long, long time. I remember them being very prominent back in the 1980s, but the company was actually founded in the 1880s! They’ve had their ups and downs, but they always seem to have some quality, affordable gear in their lineup. Remember that whether a guitar brand is good or not is a matter of opinion. I can only tell you what I think, and I’ve always liked Washburn. It’s important to do your own research and draw your own conclusions. I like the taylor the best, the seagull is great quality for sure and is probably my second choice but I find taylor guitars so easy and comfortable to play. I heard every guitar on this article and I fell in love with the PRS. I bought it right away and it sounds amazing. Second place goes to Yamaha, loved that one too, but maybe I got a little bit too carried away about the PRS brand. What about the 2015 Breedlove Stage or Studio Dreadnought lines? All solid woods this year, US engineered/QA but built in Korea. What about the PRS SE Angelus? Beautuful guitar with a very round tone. It comes with a case and everything too! fit and finish with no frills. The Mexican made Taylors and Martins do not have a very good tone acoustically, and when you can buy an all solid wood guitar made in Canada for less than a laminated guitar built in Mexico or China, that is a plus in my book. Thanks for some great advice, Jeff! 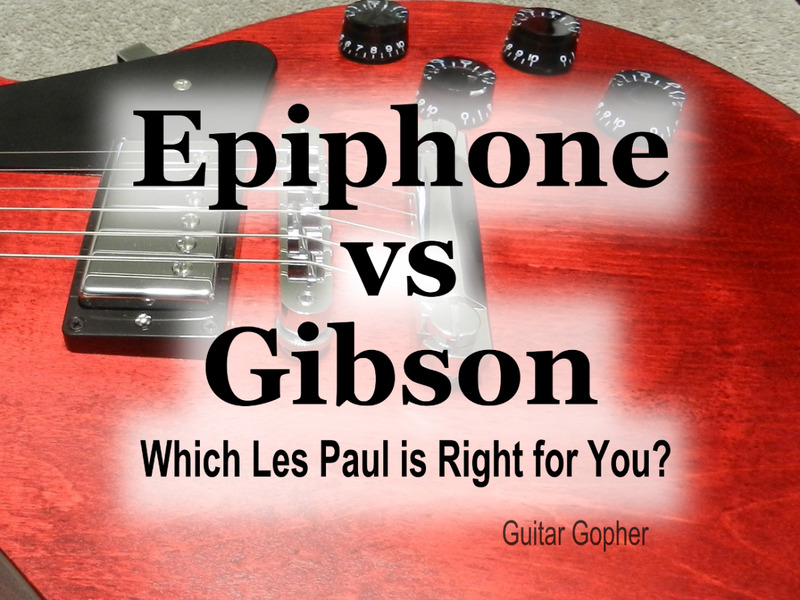 Epiphone is very underrated, especially their higher-end instruments. I'll put any of the Epiphone Masterbilt guitars up against these fine guitars. The Masterbilt line is Epiphones top of the line acoustic guitars, you can purchase the EF models for about $700 while the DR models will cost you about $599 although I have found some excellent "B-Stock" Masterbilts for around $450. These really are fantastic acoustic guitars! all solid-wood, bone nut/saddle, Grover tuners and a great preamp (esonic2) pushing 2 pickups. These are beautiful guitars that truly sound as good as they look. They have a clean crisp sound, excellent necks and they ring out and sustain for days! If your looking around for a new acoustic don't let the name fool you, yes it's an Epiphone but these are a totally different animal! If your budget challenged like me this is a great buy. I'll take that Blueridge every single time....but then again, I've never seen or heard of a Bedell or a Recording King. I think what the major distributors carry is different region to region, but then again I haven't got to go "kick tires" in a big guitar store in a few years.